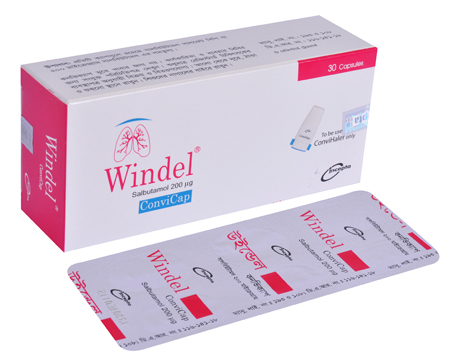 Windel ConviCap: Each capsule contains Salbutamol Sulphate BP equivalent to Salbutamol 200 µg inhalation powder. Salbutamol is a beta-2-adrenergic agonist drug which produces bronchodilatation through stimulation of beta-2-adrenergic receptors of intracellular adenyl cyclase, the enzyme that catalyzes the conversion of adenosine triphosphate (ATP) to cyclic-3\',5\'-adenosine monophosphate (cyclic AMP). Increased cyclic AMP levels are associated with relaxation of bronchial smooth muscle and inhibition of release of mediators of immediate hypersensitivity from cells, especially from mast cells. For the relief of bronchospasm in patients with asthma or chronic obstructive pulmonary disease, and for acute prophylaxis against exercise-induced asthma or in other situations known to induce bronchospasm. For the relief of acute asthma or before exercise 400 µg (2 ConviCaps). The recommended dose for maintenance treatment or prophylactic therapy is 400 µg (2 ConviCaps) three to four times a day. Maximum dose is 1600 µg/day. In the treatment of episodic asthma or before exercise 200 µg (1 ConviCap). The recommended dose for maintenance treatment or prophylactic treatment is 200 µg (1 ConviCap) three to four times a day. Maximum dose is 800 µg/day. Salbutamol may cause fine tremor of skeletal muscles (particularly the hands), palpitations and muscle cramps. Tachycardia, tenseness, headaches and peripheral vasodilatation have been reported after large doses. Salbutamol should be used with caution in patients with hyperthyroidism, cardiovascular disease, occlusive vascular disorders, hypertension and aneurysms. Hypokalaemia associated with high doses of Salbutamol may result in increased susceptibility to digitalis-induced cardiac arrhythmias. Tachyphylaxis with resistance may occur with prolonged use of high dosage. Care is necessary when treating patients with diabetes mellitus or closed-angle glaucoma, and in those receiving antihypertensive therapy. The drug should be used during pregnancy only if the potential benefit justifies the potential risk of the fetus. It is not known whether this drug is excreted in human milk. Because of the potential of tumorigenecity shown for Salbutamol in some animal studies, a decision should be made whether to discontinue nursing or to discontinue the drug, taking into account the importance of the drug to the mother.